"We just expect to do fine, balanced journalism." Is there anybody that's genuinely on the fence about Fox News? Either you subscribe to the theory that conventional media outlets (CNN, the broadcast networks, the New York Times, the Washington Post) have an outrageously left-leaning bias, and that Rupert Murdoch's FNC is a necessary corrective; or you think that the Fox News Channel is essentially the Bush Administration's Ministry of Information, recklessly reporting on the 2000 Presidential election, praising the President with slavish obeisance, insisting that prosperity is just around the corner, trumpeting our march into Iraq. This is Murdoch as a 21st-century Hearst—if Rummy supplies the pictures, Rupert will supply the war. Basically, the division over Fox parallels precisely the blue state/red state divide in the previous presidential election, likely to be replayed in the forthcoming one. 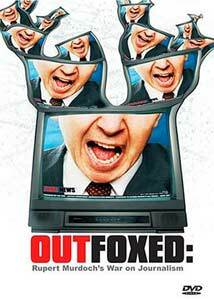 Outfoxed is a takedown job on Murdoch's network, and its audience no doubt is self-selecting—it's hard to imagine anybody with the inclination to watch this DVD, before pressing the PLAY button, being shocked, shocked that Fox is biased. But filmmaker Robert Greenwald and his crew have done yeomen service, culling together highlights of Fox's distorting techniques, its obvious on-air bias, and its destructive implications for our media and our democracy. Personally, what I've always found most vulgar and unforgivable about Fox is not its conservative slant, but its blatant hypocrisy. Reasonable people can reasonably disagree; it's why we have a First Amendment, and it informs some of the honest discourse on the conservative side in this country, in places like National Review and even Murdoch's own The Weekly Standard. (Yes, this is the some-of-my-best-friends-are-conservatives portion of the review.) But what's grotesque and Orwellian is an obviously partisan network calling itself fair and balanced, doing its best to smear those they don't like, and making sure the troops have their marching orders for the day so that everyone will stay on message. Outfoxed is very good in demonstrating the repeated techniques used on Fox to shut down any serious debate—the most endearing of these is probably O'Reilly's "shut up" montage, in which he tells guest after guest to shut up, shut up, shut up. Another favorite is "some people say," the three magic words that are so vague that they allow you to say anything about anyone: "Some people say that a Kerry presidency would be a disaster." "Some people say that Wall Street will tank with a Democratic victory." "Some people say that John Kerry has sexual congress with chickens." We report. You decide. Even better is the film's portrait of the network's Stalinist culture of intimidation, with daily e-mails from exec John Moody, insisting on the network's storyline of the day—this is of course the exact opposite of news, which is not what you want or hope it to be, but what it actually is. (The blurring of news and entertainment is of course a Murdoch special, and it has reached preposterous proportions with FNC's Fox News Alerts, about such things as Ben Affleck and Jennifer Lopez breaking up.) Greenwald has rallied many former Fox employees and contributors, some of them on camera to talk about getting strong-armed by the brass, others still too afraid and agreeing to participate only through audio recordings making their own voices unrecognizable. Of course, in Murdoch's universe, all enemies must be vanquished. Richard Clarke has to be torn down, gay marriage is a threat to our way of life, a George W. Bush defeat is "the unthinkable." In many respects the cornerstone of Outfoxed is an exchange between O'Reilly and Jeremy Glick, whose father, a Port Authority worker, was killed in the 9/11 attacks; Glick subsequently signed a petition protesting the war in Iraq—O'Reilly shouted that Glick was disgracing his own father's memory, told his guest to shut up, had his microphone cut off, and ended the interview early; and then, off camera (according to Glick), Fox employees told Glick he should leave the building, for the threat of physical violence from the host was a palpable one. This isn't reporting, or opinion, or dialogue; it's schoolyard bullying, and to call it news is to disgrace the tradition of Edward R. Murrow. Outfoxed doesn't help its cause with goofy little graphics, like little cartoon Rupert Murdochs up to no good; it only feeds the idea that this is just grassy knoll stuff. And the feature is overcut, too; give the people at Fox enough rope with which to hang themselves, and they will, but sometimes this looks like Avid Gone Wild. Greenwald has rounded up some of the usual suspects—Jeff Cohen, David Brock, Al Franken, Bernie Sanders, even Walter Cronkite—to help indict Fox for its bias, but it doesn't get at some of the bigger questions about the network: Why is it so popular? Who's watching? And what does its success mean for other media outlets, and for our democracy? But perhaps this isn't the time for those questions, as Election Day approaches and Fox continues to carry water for the White House. So Outfoxed will make your blood boil if you agree with its premises (as I do), and that's just the response that the filmmakers are looking for. Thank them for their efforts, and then surf on over to C-SPAN. Image Transfer Review: This is principally a clip job, and the bits are of varying quality; some of the early Fox News stuff is of especially low resolution. But how much more of Neil Cavuto do you really need to see to have your sense that he's loathsome be ratified? Audio Transfer Review: It's all comprehensible, which is about what you can ask for on a project like this. Extras Review: The only extra (other than a trailer for another Greenwald documentary, about the war in Iraq) is a behind-the-scenes look (29m:07s) at the making of the film, focusing on the good souls from MoveOn.org who volunteered to watch Fox day after day, in the search for red meat. It also features many members of the production team, who all share that bleary-eyed look of working too hard for not enough pay, but knowing that they're on the side of the angels. Rupert Murdoch's Ministry of Information gets the treatment it deserves in this documentary; and if you're like minded, the greatest service you can do is not watching this film, but passing along the DVD to the dittoheads, to those who have been Hannitized, to help bust them out of the no-spin zone. They distort. They deride.